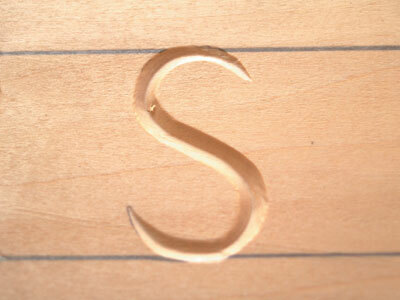 Lettering is a necessary part of a woodcarver's repertoire and it is something that I am constantly asked about. In fact, when I am demonstrating, lettering is the most popular part and something I can share with interested students who, with a little guidance, can quickly achieve good results. I see many methods of incising lettering, some of which are so proper that I would have to vastly expand my toolkit to include the infinite variety of sweeps etc to cover all the different curves necessary to carve the wide range of letter sizes available to us. While this approach has its place, I do not think that this is always necessary. 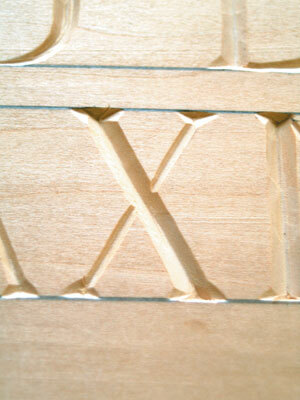 For me, the entire alphabet in all its guises and sizes can be carved with the single 'V' tool. 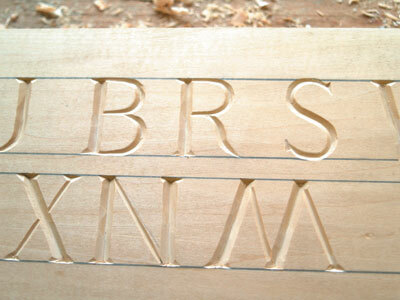 In fact, I will go further and say that the Roman style of lettering we use today has the look it does because it has evolved from the tool that created it, a humble 'V'. 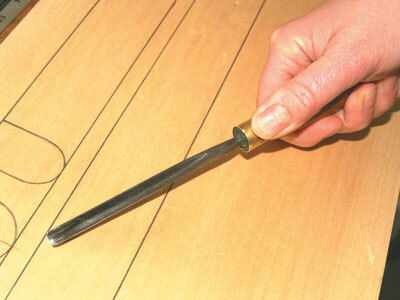 The Romans tended to use a single tool in most of their number work. The Roman numeral system they used was designed - or evolved, as is my contention with the Roman lettering - from this fact. With a single chisel we can mark from 1-99 without using a single curve and this is quite handy for busy workshop expediency. 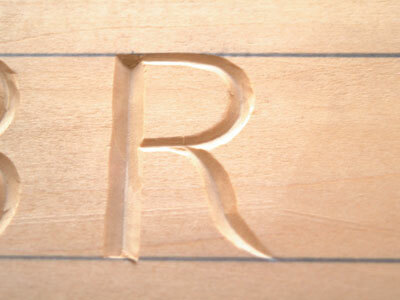 Even their simple counting system - four vertical marks with a diagonal through to denote five performed in blocks for ease of reckoning - which we still use today, was designed to be created with a single stylus on a clay plate. The main problem with the 'V' tool as a mainstay to the carver is that it is seen to be difficult to sharpen, and when I look at these tools in student or even professional carvers' kits they are often sharpened in such a way as to be almost useless for proper function. Nevertheless, all the delicate curves, the varying depths that give us the graceful arcs and the serifs can be created using this single tool with a minimum of fuss and can be a delight if the tool is properly honed and handled. 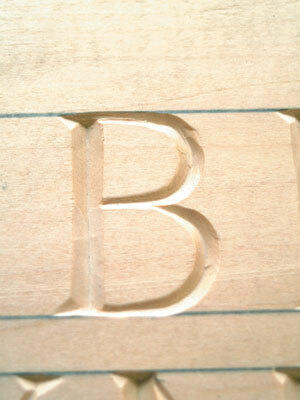 It is of great importance to correctly organise the layout of your lettering and great care should be taken. 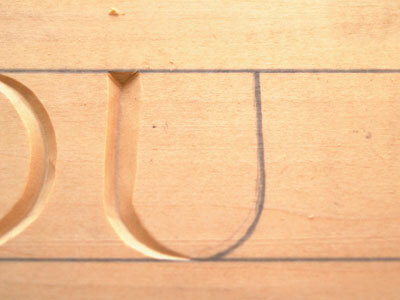 Always work within drawn lines; nothing looks worse than letters rolling unintentionally up and down in height. Working strictly between those lines stops all that. Correct and constant spacing between lines is also important. Once this is established we turn our attention to the letters themselves and their organisation. Remember that some letters are considerably larger than others; 'M' and 'W' for example are bigger than 'I' or 'T' and subsequently have to be allowed for. 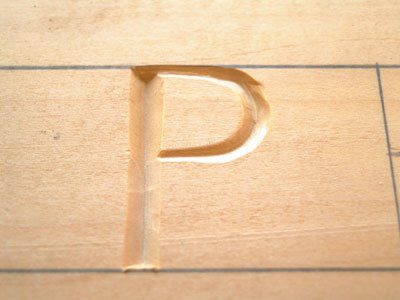 It is because they are so big that these are the letters we can squeeze up a little and still look right. It should also be remembered that letters have a relationship with each other and different relationships with different letters. The 'T' and the 'A' or 'O' together form a different look to a 'T' and an 'M' together, for example. 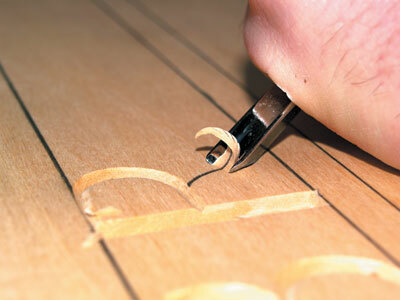 Letters should be carefully balanced by this relationship so that the piece looks right. I cannot emphasise enough how important this is. A Rolls-Royce saying was, "If it looks right then 99% of the time it will be". I have carried that thought with me as a yardstick. 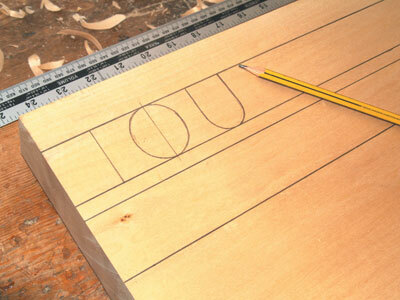 When the letters are laid out in soft pencil - 2B is ideal because it doesn't bruise the wood so much and is easier to remove - lay them out as a single line. Why will become apparent later as we progress (see photo 1). Having considered each letter's relationship and its 'appearance' with its neighbour, it looks better if we clearly treat each word as a definite block, performed by leaving ample space between words. In some examples I have seen an asterisk carved between each word. Not only does this look better, it is easier to read - an essential but often neglected requirement. Old English script can often be very difficult to decipher - sometimes even with modern sign-writing techniques this lack of clarity can be self-defeating. 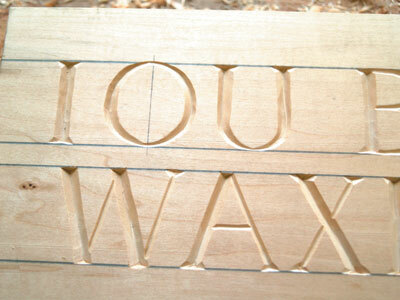 Once the letters and form are laid out to your own satisfaction begin the carving process. My old faithful 'V' is an Addis 1/4in x 90 degree. I prefer 90 degree because more broadness can be achieved on the curve by simply increasing the depth; it does have the disadvantage that the cut is shallower, but this can easily be remedied by re-cutting with a 70 or 60 degree tool, especially on curves. Holding the chisel correctly is essential for this work as we have to be able to stop the tool in its groove precisely and consistently. It all begins with the grip. 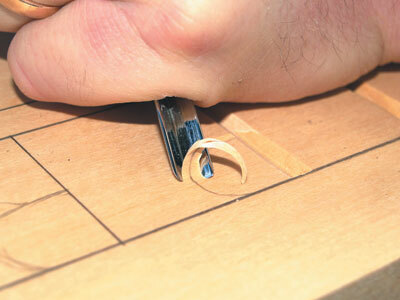 Hold the tool with your thumb on the ferrule in correct alignment with the 'V' groove (see photo 2). 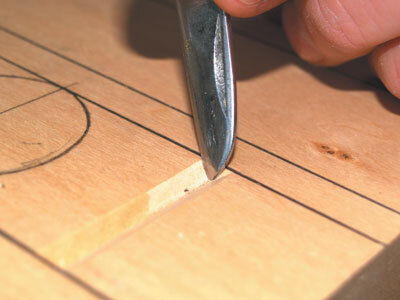 This is important because any tilting of the tool away from its vertical line will result in an un-equal cut. Instead of 45 degree shoulders in your groove you will have, for example, 30/60 or 20/70 degree etc. This will not only affect the depth but will not look good. To help with this put a blip in the right place that you can feel under your thumb; a small flat or even a piece of tape will do this. This grip is for the pushing hand that provides the power, however this power can go all over the place if not controlled and guided. 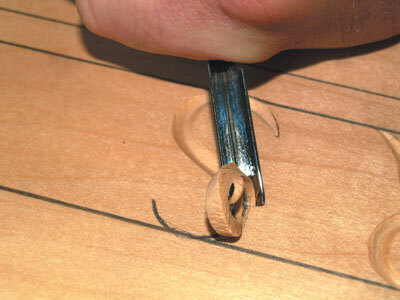 This is performed with the other hand that grips the blade directly, and by resting the heel of the hand on the work provides a very strong brake to the tool (see photo 3). Having the power and the brakes in balance we therefore have control. 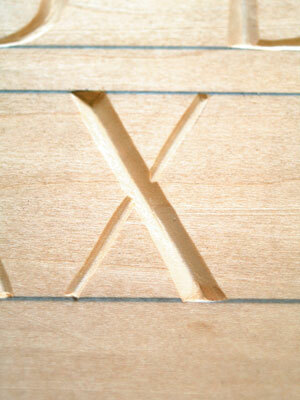 This, of course, works for all tools, not just the 'V'. When making the cut and doing our push it is important that we lock our grip as much as we can. If we try to flex the wrists to follow our curves we will lose control - it can be very tiring pushing in an unnatural and awkward direction and a tired grip can be a danger. This, of course, means that we are controlling the direction, ie following the curves by moving our whole body stance, always standing behind the tool. I think of this rather crudely but descriptively as using my backside to do this, and because of that manoeuvrability we need plenty of space around our workspace to enable us to swing round and about. 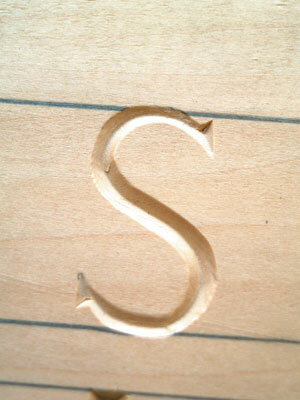 The letters that incorporate curves are seen to be the most awkward due to the symmetry required. These are 'O', 'B', 'C', 'G', 'P', 'D' and 'R'; king of all being the 'S'. I will deal with these in turn, beginning with the 'O'. 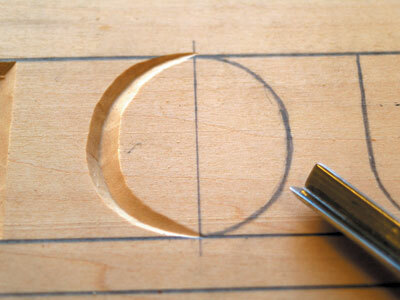 When you lay the 'O' out use a vertical centre line. 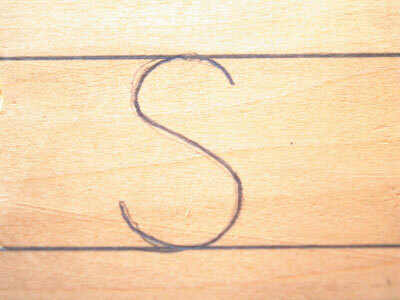 Assuming you are working vertically the sides of the 'O' are laid out in a single line as previously described. 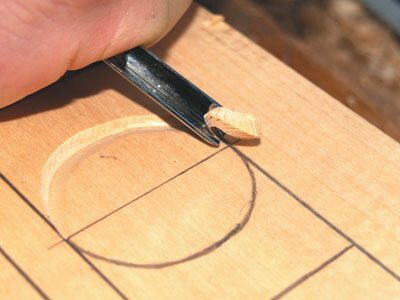 Begin your cut at the bottom, working upwards towards the left, away from your vertical centre line (see photo 7). 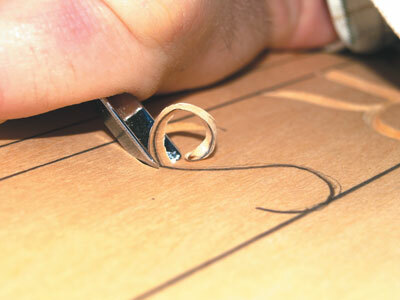 Take your lead in from almost nothing to full depth, up to the midpoint keeping the pencil line directly in the centre of your 'V' cut (see photo 8). You may find that on larger letters you have to keep stopping to break off the chip so that you can see what you are doing. Then begin your lead out to reverse the process coming out to almost nothing at the top of the letter; we do this by slightly dropping the push hand accordingly (see photo 9). 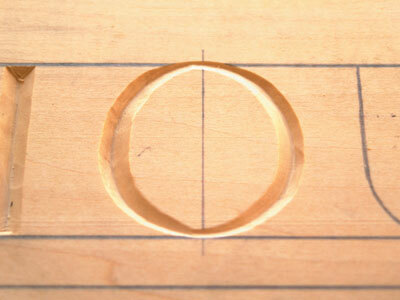 You now have a half of an 'O' (see photo 10). Repeat the process for the other half and we are complete (see photo 11). 'C', 'D' and 'G' are merely variations on this. 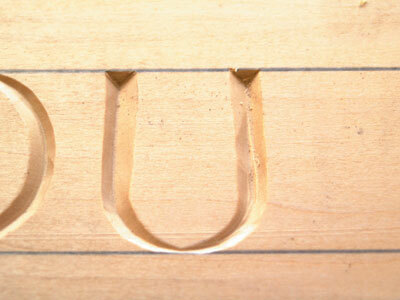 'U' is also a variation but finishes with a straight leg (see photos 12-14). 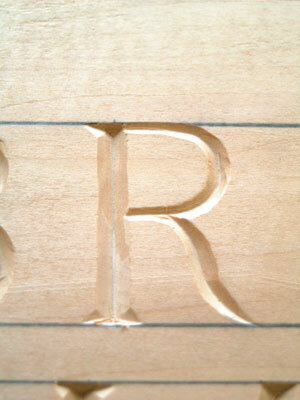 'B' and 'R' have a similar base to the 'P' so we will deal with the 'P'. 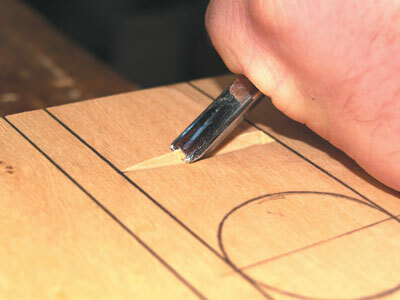 Begin by cutting your vertical straight line and then reverse your cut as previously described for an even depth line (see photo 15). 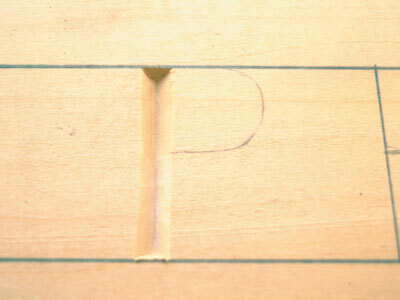 To create the curve of the 'P' begin at the lower mark which should be slightly above the centre line for good looks (see photo 16). 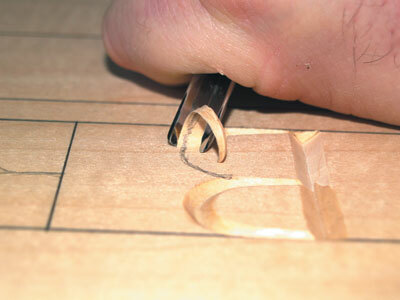 Use the lead in as you did for the 'O' taking from almost nothing to full depth of cut at halfway point then gently reverse the process coming out to almost nothing at the top (see photo 17). 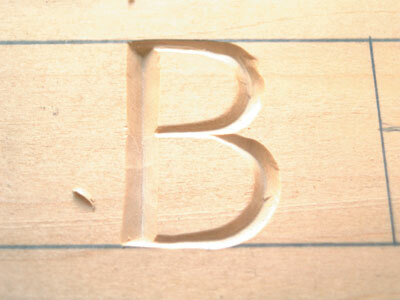 For a 'B,' do the same process at the lower half (see photos 18 and 19) and for the 'R' simply add a tail instead. 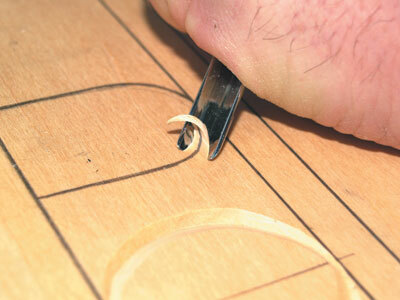 This tail can also use the lead in and out for decorative effect (see photos 20 and 21). This brings us to the daddy of them all, the 'S'. 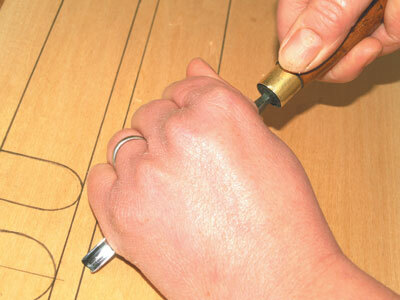 Don't be too put off with this, the trick is in the laying out; do this right and the rest is a doddle (see photo 22). Begin by taking your lead in from nothing to full depth of cut after you have got past the first turn onto the body of the 'S' (see photo 23). Maintain this until you reach the same point at the top part (see photo 24), and then begin your lead-out finishing at almost nothing at the top (see photo 25). If at any stage you have something that is a bit wobbly or shaky due to an inconsistency of depth or line following, simply go in a little deeper at that point to clean up; I do all my cleaning and tidying at the end. Practice, as always, improves performance and speed. 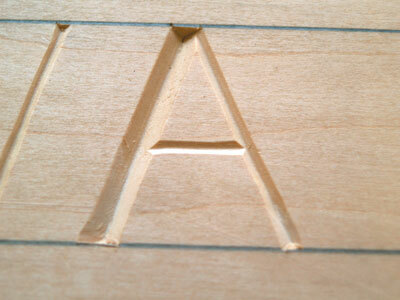 Serifs can also be created using the 'V' tool. 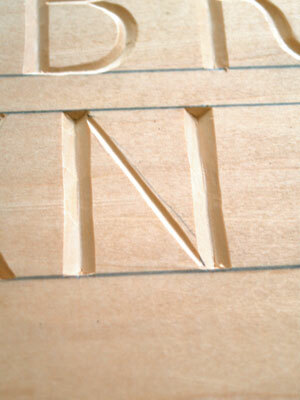 Do not overdo serifs as it is easy to cut great big ones - delicacy is the key (see photo 31). Keep between the lines and carefully follow the pencilled guidelines - the results can be quite pleasing (see photos 32-36). The addition of serifs help with the look of the finished work in that they effectively draw a line across the head and base line of the work and take the eye to a neater conclusion (see photos 37-38). 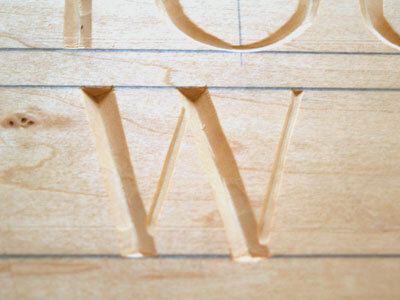 I usually finish the work by painting gold into the cuts after varnishing; take care with the proper sealing of the wood as leeching can occur through the end grain revealed and cause some blurring of the letters. 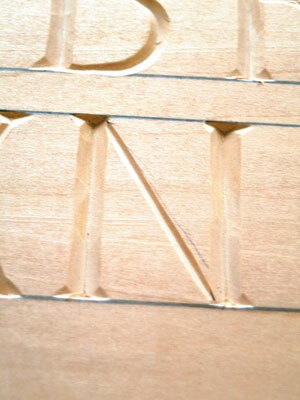 That is the 'V' tool in action, the original would have been a square bar for use on stone, but this does illustrate that for lettering work it can be the only tool that you actually need and works for all incised lettering styles, including script. Do contact me with how you found this technique. If you have any problems or need advice you can contact me via my website. 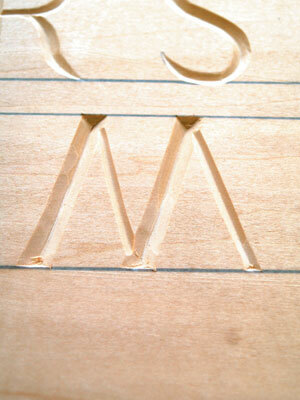 I am always interested to hear from fellow carvers. 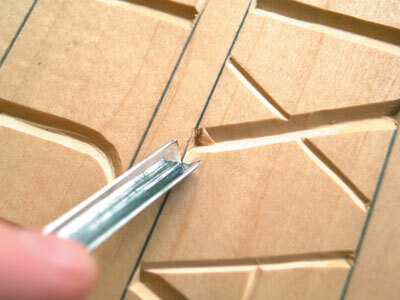 "Old English script can often be very difficult to decipher"
When you begin the cut, the tool naturally has a lead in to the work from nothing until it reaches to full depth of cut (see photo 4). This lead in can be used to great aesthetic advantage on the curves, but for our straight legs this has to be remedied. 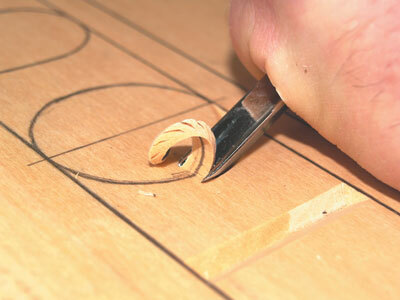 We do it by simply turning the piece round and working on it from the other side (see photo 5). 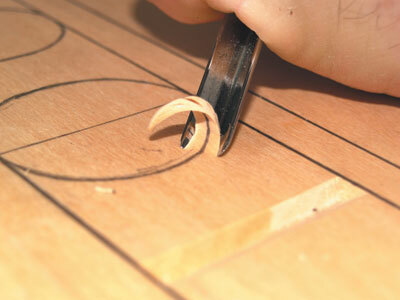 When we finish our cut at the line, the chip should break off cleanly. 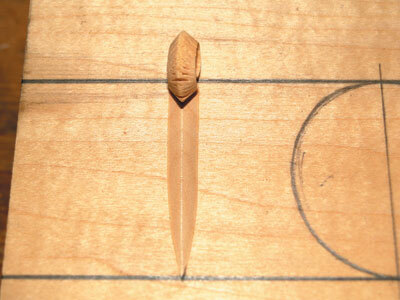 If it doesn't, use the point of a knife to sever it neatly (see photo 6).